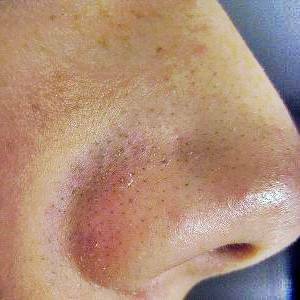 If you suffer from blackheads on nose you will want to do everything you can to get rid of them! But if you cannot be bothered messing about with sticky masks or multi-step treatments, Clearasil pads might be something you would like to try. 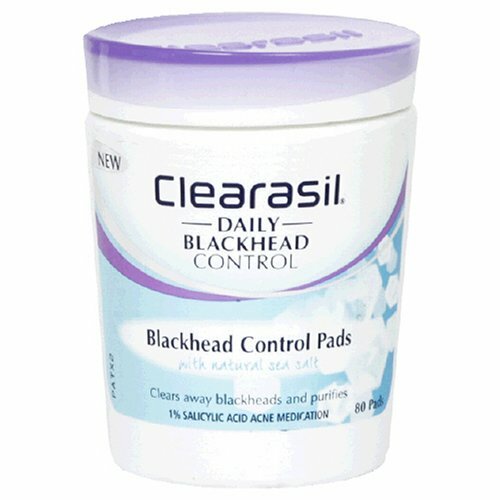 Clearasil Daily Blackhead Control Pads with Natural Sea Salt is one product aimed at treating and preventing blackheads with minimum effort and no fuss. Containing 1% salicylic acid, the pads are formulated for acne prone complexions and Clearasil claims that they will eliminate existing blackheads on nose as well as cleansing and shrinking pores. Prepare your skin by cleansing with your usual cleanser, then rinsing thoroughly. Pat your face with a clean, soft towel to remove some of the water. Take one pad from the tub and wipe it over your nose (or your entire face, if you have blackheads in other places apart from the nose). Use only one pad per day to begin with, to give your skin time to get used to the product. Salicylic acid is known to cause dryness, so this is to be expected. Increase to three applications per day if you feel this is required, or in accordance with advice from a dermatologist. If you find this makes your skin too dry, however, reduce it back to only once per day. Moisturize liberally after each use to help prevent dryness. Keep this product upright in a cool, dry place and make sure the lid is tightly closed when in storage. The tube contains 80 pads, so this product could last for almost three months if you use one pad per day. If it works for you, this makes it great value for money. Indeed, it does appear to work for a large number of people. As well as proving to be successful in removing blackheads on nose within a short period of time, many people are pleased that Clearasil Daily Blackhead Control Pads really work in closing open pores. Open pores are considered to be an undesirable sign of ageing, so this could be an added bonus of buying this product! The less positive reviews of this product claim that it leaves an oily film on the face and causes the skin to break out even more. Of course, this could be due to these people not using the product correctly or using it at the same time as other acne products which is not recommended. It is normal for the skin to break out in more pimples when you first start using a new acne treatment product. Normally after a couple of days the skin gets used to the ingredients in the product and the break out recedes. If this does not happen, perhaps this product is simply not the right one for you. Most users, however, do recommend this product for treating blackheads on nose. Ideal for traveling, quick to use, completely fuss free and good value for money are plenty of reasons to give Clearasil pads a go!